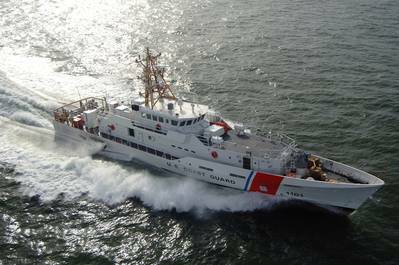 Bollinger Shipyards, Inc. has delivered the 'William Flores', a third Fast Response Cutter (FRC) to the United States Coast Guard. The 154 foot patrol craft WILLIAM FLORES is the third vessel in the Coast Guard's Sentinel-class FRC program. To build the FRC, Bollinger Shipyards used a proven, in-service parent craft design based on the Damen Stan Patrol Boat 4708. The cutter has a flank speed of 28 knots, state of the art command, control, communications and computer technology, and a stern launch system for the vessels 26 foot cutter boat. The FRC has been described as an operational “game changer,” by senior Coast Guard officials. This vessel is named after Coast Guard Hero, Seaman Apprentice William Ray “Billy” Flores, who gave his life to save his shipmates after a collision between the Coast Guard Cutter Blackthorn and the 605-ft. oil tanker Capricorn in 1980. He was posthumously awarded the Coast Guard Medal for heroism.